In August 2012 the abbey dispensary was blessed to have visitors from Germany; with them, they brought some medical supply for the dispensary. Of course this is not the first time for visitors from Germany to help the dispensary with medical supplies. Sometime there have been volunteers working at the dispensary for few months or a year or two. We thank them for their generosity which makes it possible for people with low income to afford medical costs at the dispensary. It hard to imagine sometimes people would not go to a dispensary to get malaria treatment for a dollar and risk to die. But with help like this one from Germany it relieves the burden. In the photo below visitors are presenting gifts of medical supplies to Frater Lucius Matembo, OSB, the head of the dispensary. 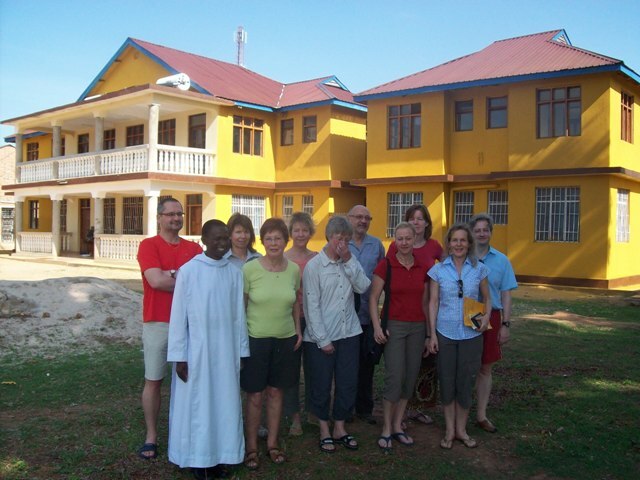 The Benedictines from different convents and abbeys in southern Tanzania met at Hanga Abbey in the first week of August 2012. The participants in the get together and some presentations on Benedictine life were the formators and the novices from the different repectictive abbeys and convents. The represented houses included abbeys of Peramiho, Ndanda, Hanga and Mvimwa. Convents that participated were Missionary Sisters (commonly called Tutzing Sisters) from Ndand and Peramiho; others were from Imiliwaha convent in Njombe, Chipole in Songea archdiocese and Camaldolese from Iringa. It was a nice convention which manifested a continued future of religious life in the Benedictine communities. Participants were happy to be at Hanga Abbey for the meeting and enjoying themes presented but even more so they enjoyed to see what Hanga Abbey lookis like, what the monks of Hanga do and enjoyed staying in the new St. Pirmin Guest house a facility that is really a state of the art! Pictured below are the participants of the meetings with monks of Hanga abbey.